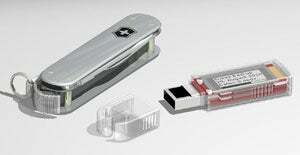 Victorinox is unfolding a trio of Swiss Army knives that include secure USB drives--including what it calls the world's smallest solid-state drive. The Victorinox Secure SSD stores 256GB and is supposed to offer double the read speed and triple the write speed of other fast USB flash drives. In addition to secure data encryption, it sports a customizable LCD/e-paper display that shows how much space is available. The waterproof, shock-resistant Victorinox Slim and Slim Duo come in multiple colors and include a nail file, blade, and scissors as well as a USB fob that holds up to 64GB on the Slim or 128GB on the Slim Duo. Should you fear a holdup at the airport security line, the Slim is available in a knife-free, "flight friendly" version. In 2010 the company launched a USB key with a self-destruct mechanism. Victorinox also announced the Presentation Master, a USB flash drive and pocket knife with secure data encryption that includes a Bluetooth remote control, fingerprint authentication, and a cat-teasing laser pointer.